Do you really need that 100 watt lamp at full power all the time? You can save energy and prolong the life of your bulbs by using dimmers. Believe it or not, dimming a bulb by 15 percent can double the bulb life and shave a few dollars off your yearly energy bill. (Check out Lutron’s Interactive Dimmer Calculator to see how much you can save.) The best part, dimming by 15 percent is imperceptible to the human eye. One caveat: Dimmers that are more than 40 years old won’t save energy, just bulb life. The old dimmers simply convert excess energy into heat. To help you—and your kids—figure out what a 15-percent-dimmed fixture looks like, Lutron introduced a line of Eco-Minder dimmers that glow green once you’ve reached the 15 percent savings mark. 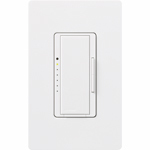 Lutron Meadowlark Eco-Minder dimmer ($24.80) Set this dimmer to 15 percent and forget it. The on/off switch works separately. 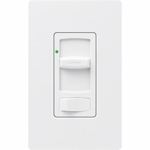 Lutron Maestro Eco-Minder dimmer ($45.50) Tap once for your favorite energy-saving light level and twice for full on. Remember, most CFL and LED bulbs will not work with dimmers. However, if you are using one of these bulbs, the power consumption is so small you don’t need a dimmer to save energy.